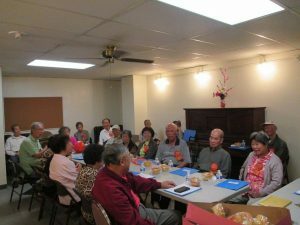 On August 8th at 3 p.m., Wellness Director Nancy Lu hosted a Health & Wellness Connection Committee Board Meeting with 26 board members. At the meeting, Nancy expressed her gratitude for everyone’s time and effort in making the Wellness Connection such a success. She talked about how to even further improve the wellness plan through closer caregiver engagements. Board member Ms. Lisi You shared how she asked the therapist to educate her caregivers on the therapy exercises. This way, the caregivers are not only able to learn and help Ms. Lisi You perform her exercises, but this time spent together will also allow them to build stronger emotional relationships, which is vital in creating a more effective wellness plan. ← What are the most common chronic conditions of Hotel Oakland Village residents?